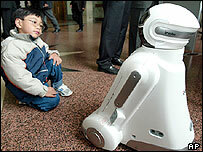 Robots are set to become increasingly familiar companions in homes by 2007, says a United Nations survey. Seven times more robots will helping us out with the cleaning, security and entertainment in three years' time, as their price falls and they get smarter. It is not quite the humanoid vision of blockbuster film I, Robot as many of them will be vacuum bots. Two-thirds of the 607,000 domestic robots in use were bought in 2003, says the UN's annual World Robotics report. Robot pets: A human's new best friend? As well as the vacuuming, they will take over tasks like mowing the lawn, cleaning pools, and washing windows. Robots like Irobi, unveiled this week by Korean company Yujin Robotics, will be able to multiple tasks. It is a net-based, all-in-one family robot complete with educational functions, home security, diary, entertainment, and message delivery capability. Robots will also be keeping humans company and entertaining them much more, becoming a part of home life. By 2007, it is projected that there will be almost 2.5 million entertainment and "leisure" robots in homes, compared to about 137,000 currently. 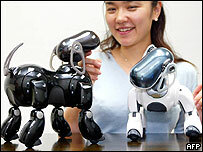 Sony saw global sales of their high-end robots, the all-dancing, voice-recognising, dog-like Aibos, climb this year. About 692,000 of them have found homes since its release in 1999. Aibo enthusiasts even meet up to play Aibo football and hold dance contests. Aside from playing football and jigging in the home, robots are increasingly being used to carry out more hazardous or specialists jobs. Robots involved in more serious tasks, like scientific and medical research, defence and surveillance, as well as mine-clearing, will also enjoy a boom in popularity, says the report. Researchers around the world are developing robots for multiple uses, and many are making them a lot smarter and autonomous by developing AI systems (Artificial Intelligence). The survey also confirmed that the number of robots in industry has grown globally, with record orders in 2004. Robot investment in the UK grew by 48% in 2003, but robot use in the UK is still lagging far behind the rest of Europe. Would you welcome having a robot in the home to do your chores? What you would like a robot to do for you? Is it right to get robots to do our dirty work? Here are a selection of your comments. I would like having a robot to help me to do something, like taking care of my baby in case he fell from bed or something bad to happen to him, or for cleaning house etc. But that wish must depend on a cheaper price or we can't afford it. Imagine a shopping trolley that followed you around the store, or robotic luggage trolleys in airports maybe? I think it would be very useful just to have a robot to lift and carry things around. Imagine a shopping trolley that followed you around the store, or robotic luggage trolleys in airports maybe? I would welcome robots in my home to do my chores, as long as they were correctly set up and not too expensive. If they were extremely expensive then I would not want to use them in case they were damaged! I can't really think of anything a domestic robot could realistically do other than floor-related things (grass cutting, vacuuming) or fetching me things. Maybe a security robot would be good, but if it hurt someone trying to get into your house you would probably be locked up for it nowadays! It's right to get robots to do our dirty work as they cannot feel and are completely emotionless so they can carry out tasks more effectively and efficiently than humans. I'd find some of them more a hindrance. Why would I want some bulky plastic thing taking up floor space, when I can just get out my vacuum for a minute or two a day? The only way I'll be convinced is if a robot can de-ice my car in the morning, I'd pay good money for one of those! Since the introduction of labour-saving devices there has been a noticeable increase in mental illness, silly ideas, depression, stress and anxiety. Arguably this is due to the amount of time we now have to sit around wondering what to do. I don't mean that we should return to the days of endless hard work just getting the washing done/house cleaned. But there is a limit. More machines means more isolation which in turn will lead to more illness, more depression and more anxiety. One wonders whether we will live to see a "bonfire of the micro chips", when people burn their computers, robots, mobile phones etc in an attempt to get their privacy and minds back? I'm all for progress and love the thought of having a robot in the house to vacuum, cook, clean etc. You can't stop evolution, we're surrounded by computers everywhere we go, so having ones that can, in part communicate with us is just the next link on the chain! I have to say it seems to scary to be honest. Although I do like the idea of cleaning robots. Lets just hope and pray they don't take over the world! I'm half and half about the whole robot idea. I think that we must use the robots for all our dirty works but not as a pet or friend. To accept them as a friend kills our emotions. The robots can be strong, useful and fast, but they don't have a heart. My feelings on the matter of robots in the home are good, I have purchased a Sony Aibo and they are great fun and harmless. I think that as long as it does not go to far as a robot baby sitter etc. People need to try and remember that they are still computers driven by software and prone to crashing, hackers and such like. Haven't we seen enough dodgy movies to learn that, ultimately, robots will take over the planet and enslave humankind? This is a bad idea! I think it is actually quite scary, I'm all for techno-advancement; but it could end up being like The Terminator one day when computers rise up to dispel their war-mongering creators. You only need to look at how hackers are already recruiting networks of thousands of 'bot computers to wage virus war against millions of innocent people. We are using robots already, to do the washing, drying etc. The only difference is that, in the future, we will have those that can multi-task and, most importantly, move about and probably have voice recognition capability. A modern robot is nothing but a fancy spanner. Would I let it do my dirty work? Yes! What do you mean, "is it right to get robots to do our dirty work?" That's like asking, "is it right to use a car to get you from place to place!?" It's a ridiculous question, robots are machines, tools and nothing more. I know how it might be nice to think of films like Millennium Man or I Robot or The Matrix and give robots an intelligence they simply do not posses at this time (and it's very doubtful they ever will). A modern robot is nothing but a fancy spanner. Would I let it do my dirty work? Yes! I already have several small robots around my house. We have an i-Cybie to entertain the younger kids, a Robosapien for the older one and kit built one as an experiment. I think robots can be invaluable tools for learning but could also be used for dangerous jobs that really help save human lives. I don't think we should allow ourselves to become dependant on robots for all things though otherwise we would very quickly find ourselves out of a job! Since robots are currently incapable of conscious thought, there is no reason they should not be used for doing our dirty work, as they are tools, but cleverer than conventional ones. However, were AI to become so advanced that they were sentient, at that point our using them for dirty work would be comparable to slavery. I'll be fine for a while until the robots start to get a bit clever. Then no doubt you'll have people campaigning for rights for robots. Probably with the slogan "Robots are people too"
I have a Sony Aibo ERS-7. 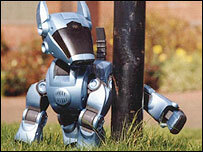 It's as much fun as a smelly hairy pet but I can switch Fred (the Aibo) off when he starts annoying me. No vets bills, no poo and no biting. I'm looking forward to using more robots in my home. Those of us with our eye on the ball know that the promise of a technology-supported, Utopian future is a hollow one. At best, we have the prospect of malfunctioning robo-butlers crashing over the furniture and spilling our G&Ts on the automated stealth hoover; at worse, the terrifying reality that our cybernetic homes will one day turn on us, forcing humanity into a desperate, apocalyptic battle for survival across the nuke-ravaged wastelands of our once-beautiful planet. Anyway, amid all this talk of "domestic intelligent service robots", where is the one thing we were promised in the 1950s and have been waiting for ever since - the one thing we really want? In short: where's our flying car? Hello, films like The Terminator are only fiction! Get real. The observation about robots rising up is pure silliness; your ironing robot is hardly likely to decide to make a break for freedom one day because your ironing robot cannot "decide" anything, all it can do is follow its programming, just like any other computer today. The danger here is the development of artificial intelligence, something which is not likely to happen soon if at all in our lifetimes. I do not understand how people want to substitute beings with robots. A dog is a dog, Aibo is not a dog. It is really "cool" in one word, but nothing more than that. Some people have asked robots that clean and push trolleys. Well that can exist now, but people can do that. I can assure you that there are thousands of people in your cities interested to do those things. Hence, the money gives them incentive to do the job as better as possible. Why not give human beings a change, but we are already occupied with the idea of robots. There is no substitute for warm human contact, real emotion, compassion,and understanding. Above all a sincere heart. Let's move with the times but lets not forget the need for the more basic things in life, love and affection, only a real friend, dog etc can offer these things.Robots are fine in their place but I don't think the home is that place. I'm all for robots doing the house work but I think there are much more important things that can be done using the technology that is around today. Think of the possibilities when poor underdeveloped countries could grow and produce areas of crops faster with robots that can do the job of 20 people in half the time. I think it would be foolish to turn our backs on something that could have the potential to solve a lot of the worlds issues. I'm not saying they could be the solution to all our problems, but it could be a good start. You can hear more on this story on BBC World Service radio programme Go Digital.